Sharing research data or Open Science, aims to accelerate scientific discovery, which is of particular importance in the case of new medicines and treatments. A grant proposal by an international research team, led by Dr Chase C. Smith, MCPHS University, and submitted to the Open Science Prize, suggests development of what the authors call The SCience INtroDuction Robot, (SCINDR). The project’s proposal is available in the open access journal Research Ideas and Outcomes (RIO). Building on an open source electronic lab notebook (ELN) developed by the same team, the robot would discover and alert scientists from around the world who are working on similar molecules in real time. Finding each other and engaging in open and collaborative research could accelerate and enhance medical discoveries. Already running and being constantly updated, the electronic lab notebook serves to store researchers’ open data in a machine-readable and openly accessible format. The next step before the scientists is to adapt the open source notebook to run SCINDR, as exemplified in their prototype. 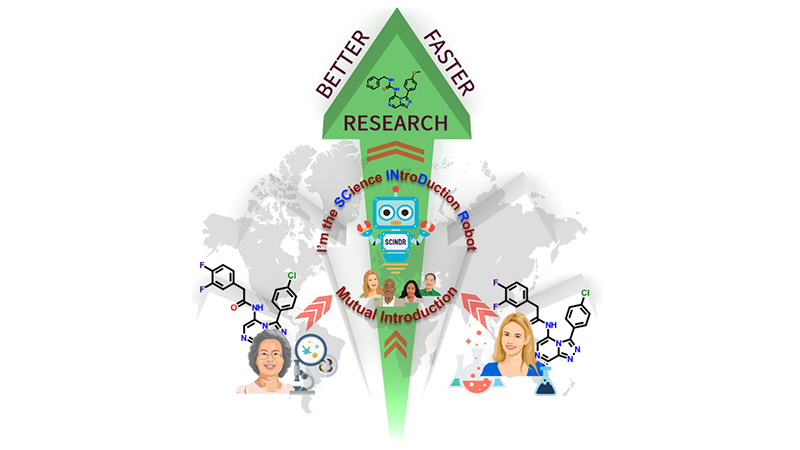 “The above mentioned ELN is the perfect platform for the addition of SCINDR since it is already acting as a repository of open drug discovery information that can be mined by the robot,” explain the authors. Once a researcher has their data stored on the ELN, or on any similar open database, for that matter, SCINDR would be able to detect if similar molecules, chemical reactions, biological assays or other features of importance in health research have been entered by someone else. If the robot identifies another scientist looking into similar features, it will suggest introducing the two to each other, so that they could start working together and combine their efforts and knowledge for the good of both science and the public. Because of its ability to parse information and interests from around the globe, the authors liken SCINDR to online advertisements and music streaming services, which have long targeted certain content, based on a person’s writing, reading, listening habits or other search history. “The potential for automatically connecting relevant people and/or matching people with commercial content currently dominates much of software development, yet the analogous idea of automatically connecting people who are working on similar science in real time does not exist,” stress the authors. “As open science gathers pace, and as thousands of researchers start to use open records of their research, we will need a way to discover the most relevant collaborators, and encourage them to connect. SCINDR will solve this problem,” they conclude. The system is intended to be tested initially by a community of researchers known as Open Source Malaria (OSM), a consortium funded to carry out drug discovery and development for new medicines for the treatment of malaria.